Corky was born in Carthage, Missouri, on Jan. 20, 1938, and grew up in Oklahoma, Missouri and Kansas. His first newspaper job was at the age of 5 when he and a little buddy sold the national publication Grit in Madill, Okla. He played all sports, but his passion was, and remains, baseball. He attended Kansas State Teachers College of Pittsburg where he was a member of the sports department and the school publication Collegio. His first daily newspaper job was as sports editor of the Carthage Press. Other jobs were at the Illinois State Journal in Springfield, the Wellington Daily News in Kansas and the Phoenix Gazette. Corky joined the staff of the Tucson Citizen in September, 1974. He covered the entire sports scene, professional, collegiate and high school. As sports columnist for the Citizen, his work was recognized by the Associated Press, the Gannett Corporation, Arizona Press Association and other groups. 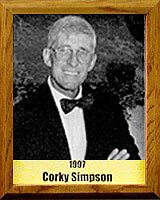 Corky was national president of the Football Writers Association of America in 1996.